My favorite vegetable these days is okra. It all started last year, when I discovered a recipe for a saute of okra with bacon, tomatoes, and sweet onion, as I hungrily perused the wonderful The Gift of Southern Cooking cookbook. Being a Northerner and all, my only previous experience with okra was, well, slimy and uninteresting. 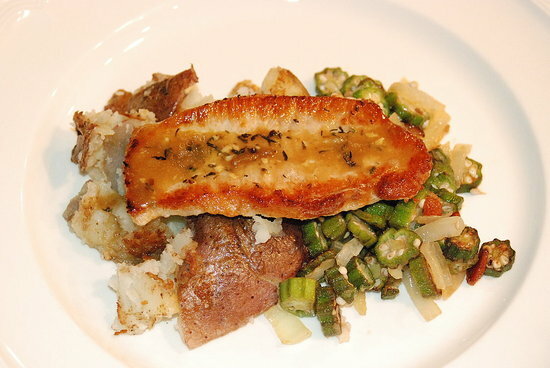 But I could see in the book’s pic that a quick saute, allowing the okra to even crisp a bit, eliminated the slime factor and achieved deliciousness. And it most definitely does, oh yes. The crispy bacon makes the dish insanely good – you’ll be glad to know that a little goes a long way. I confess I didn’t have the tomatoes last night, but the dish is absolutely delicious with just okra and onions. 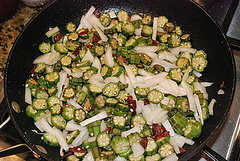 Or even just okra, which is how I often prepare it to have alongside quick chicken gumbo. 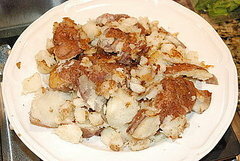 Oooh, what a great new idea with the potatoes! I'm definitely trying those...yummmm!